Detective John Kimble: [extremely annoyed] Don't you know the building is on fire? Kissing Boy: We-we thought it was just another drill. Detective John Kimble: Well, get out! Q: When Kimble has all the kids say what their dads do, what does the girl say in Spanish? Q: Is 'Kindergarten Cop' based on a book? Q: What happen to Cullen's $3 million? Love to see this film over and over again. 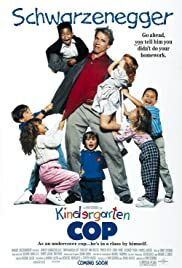 I find this was a turning point for Mr. Schwarzengger as an actor...the challenge of being on "the wave" inter-acting with children. The scenic area of the Pacific Northwest also was a plus to the film. Caroll Baker as "Mother Tyson" is a great villainess. Wish I had viewed some of her work. The white streak in her hair, was a great flash back to "Cruella De Ville". Richard Tyson as "Crisp" also plays a smarmy character. Love the contrast of short Linda Hunt's Principal to tall Kimble. Yet Linda proved she could project herself as more formidable than Arnold Schwarzenegger. I also loved the comic timing Broadway's Pamela Reed brought to the film. Her character's pragmatism to Kimble's take it all on, made for another good contrast. Overall the film is good for the whole family or a solitary rainy afternoon escape.